strict warning: Only variables should be passed by reference in /home/hotkilns/public_html/sites/all/modules/captcha/captcha.inc on line 61. The Knowledgebase is organized into a series of questions and answers having to do mostly with technical troubleshooting and understanding of kilns. Although we write this for our own kilns many of these articles apply to other makes - although L&L takes no responsibility for that. Many Knowledgebase articles have Actions, PDFs and Videos associated with them. Actions are specific actions for you to take during the troubleshooting or repair process. Each Action may also have Videos and PDFs associated with it and, in addition, specific Cautions. 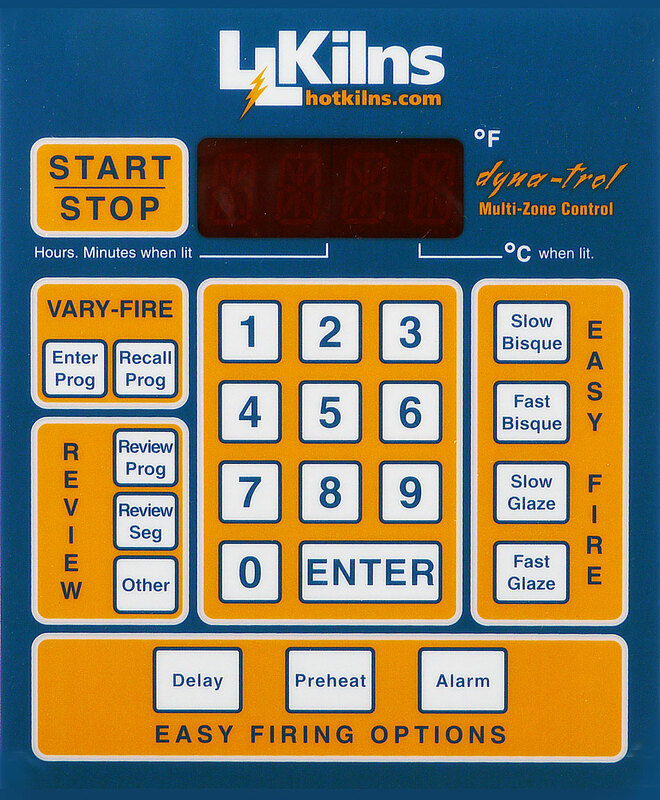 The Preheat feature can be used with the EASY-FIRE mode only. When Preheat is in use, the temperature ramps up at 60°F/hour to 200°F and then holds at 200°F for the amount of time programmed. If you start at a room temperature of 70°F, then it will take about 1-1/2 hours to reach 200°F at which time the hold segment in the Preheat will start. Preheat is automatically set to zero during EASY-FIRE programming and at the end of each firing, so if a preheat stage is wanted, it must be reprogrammed for each cone firing. Preheat Example: Set a preheat time of 3 hours. Remember: You must choose and program an EASY-FIRE profile first, before you set the preheat time. IdLE, TC2 and a temperature must be flashing to start the programming the PreHeat. See Alternately flashing 0.00 and HLd. Enter the time in hours and minutes. For 3 hours it will be 03.00. Press 3, then 0 and 0 again. The display will alternately flash IdLE, TC 2 and a temperature. The PreHeat is now programmed. When you press START/STOP the control will say -ON- and then start the PreHeat cycle. When the PreHeat cycle is done (say 3 hours in the this example) the Easy-Fire program will start from the end of the PreHeat cycle. To confirm that the program is firing correctly press the Review Prog button while the program is actually running. You will something like S-bC (for Slow Bisque if that is Easy-Fire program you are running), then PRHT , then the time that the PreHeat cycle is running, for instance 3.00, then the cone you are firing to and then various other kinds of information about your program. Note that once you are finished firing the program the PreHeat settings are erased. You must reprogram this every time you fire.